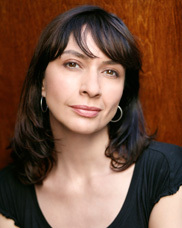 New York actress, voice-over artist & cultural advocate. Simple, truthful, real, passionate, natural, with a wide emotional range, qualities that are an integral part of Gy Mirano's character portrayals for film, television, theater and poetry performances. Credits in national network shows and independent films include Miami Vice, Crime Story, Law & Order, Double Deception, 3 Américas and Sticky Fingers. As a voice artist she has created character voices for Nickelodeon and Rockstar Games. She has narrated for PBS, HBO and Fine Arts museums across the US. Featured as the English voice of Bellagio Las Vegas and "O" by Cirque du Soleil. P.R. Oil Spill Narrator Film Response S.A.
Camino a Astlán Narrator L.A.C.M.A. Poems from the Spanish". Text and poem by Eunice Odio. "El Mundo en Llamas". Interpreter.